CRRC has written before about the ambivalent attitude of the population of Georgia towards journalists. Based on CRRC’s Caucasus Barometer (CB) survey data, this post explores the population’s trust in the media over time, showing that it has been declining steadily since 2008, while ambivalence, demonstrated by the finding that people have difficulty stating their opinion and opt instead for either/or options, has been increasing. 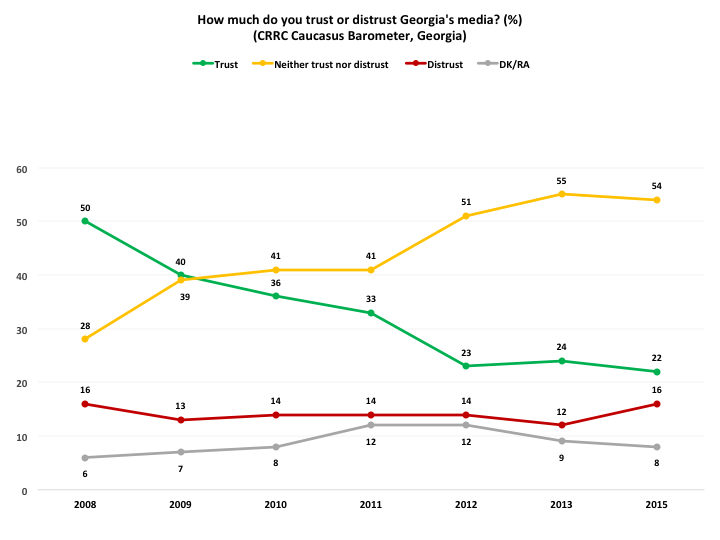 Between 2008 and 2015, reported trust in the media declined by 28 percentage points in Georgia. The biggest drops are between 2008 and 2009 and between 2011 and 2012. Interestingly, over the same period, the reported level of distrust in the media has remained rather steady. Ambivalence, however, is rising. The share of the population responding that they “neither trust nor distrust” the media climbed from 28% in 2008 to 54% in 2015. Note: A 5-point scale was used during the survey. For this chart, answer options “Fully trust” and “Trust” have been combined into ’Trust’ and answer options “Fully distrust” and “Distrust” have been combined into ’Distrust’. Caucasus Barometer was not carried out in 2014. The decline in trust and rise in ambivalence towards the media is consistent with responses to other CB questions on the media. Over time, the population’s positive assessment of how well TV journalists inform the population about what is going on in the country has also declined, while their ambivalence has risen. Since both trends are steady, this change seems to be less of a question of a reaction to specific events and more of a general shift. Between 2009 and 2015, positive assessments of how well TV journalists inform people dropped by 14 percentage points while ambivalence increased by 12 percentage points. As in the answers about general trust in the media, reported negative assessments remain stable. Note: A 5-point scale was used during the survey. For this chart, answer options “Very well” and “Quite well” have been combined into option ‘Well’ and answer options “Very poorly” and “Quite poorly” have been combined into ‘Poorly’. Similar patterns can be discerned with regards to whether the Georgian population thinks that TV journalists serve their interests. Since 2009, the share of the population who reported believing that TV journalists, overall, serve the interests of people like them decreased by 13 percentage points, while ambivalence increased by 15 percentage points. Note: A 5-point scale was used during the survey. For this chart, answer options “Completely agree” and “Somewhat agree” have been combined into option ’Agree’ and answer options “Completely disagree” and “Somewhat disagree” have been combined into ’Disagree’. This question was not asked in 2013. 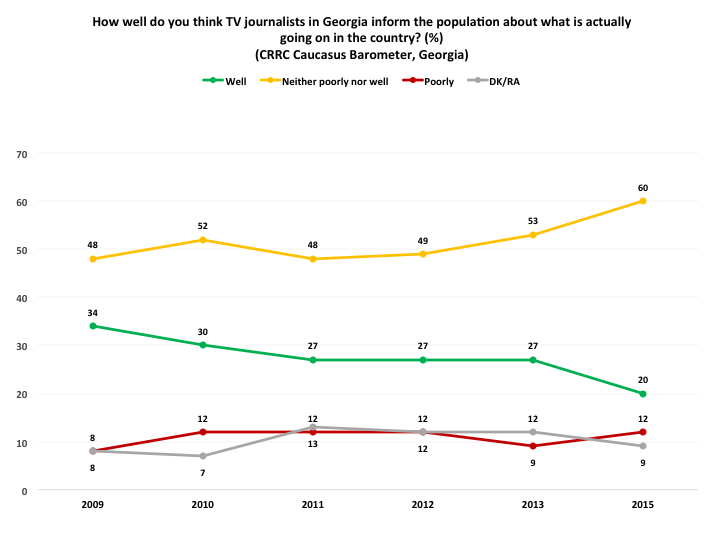 The population of Georgia’s trust in the media has been steadily declining since 2008. Interestingly, this decline coincides with an increase in ambivalent attitudes rather than distrust. The same is reflected in assessments of how well TV journalists keep the public informed and how well they represent the interests of “regular” people. In all cases, positive assessments have decreased, while ambivalence has increased. 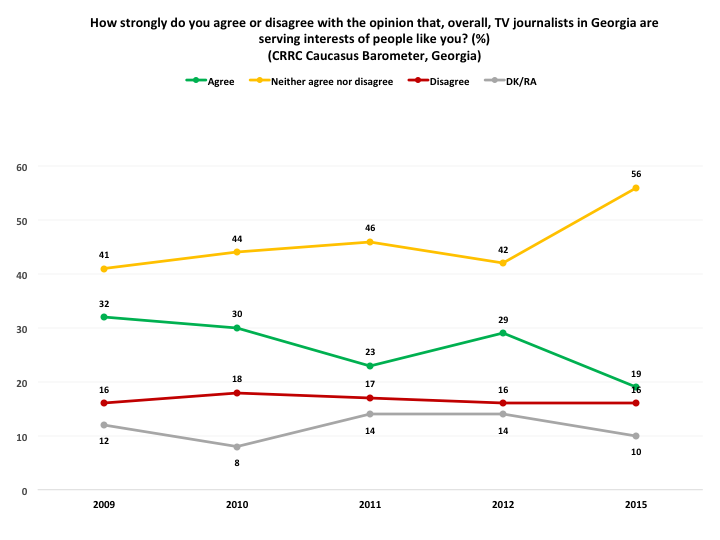 If the trends marked here are indeed general shifts in attitudes towards the media, as the data for available years suggests, this has the potential to point to long-term changes that are less attached to specific political events or media scandals and may indicate avenues for further research on public opinion in Georgia about the media. The datasets used in this blog post and related documentation are available at our online data analysis platform.